Sao Paolo’s Rogerio Ceni claims that he has reached career milestone though FIFA beg to differ. MOST GOALKEEPERS GO through their career without ever managing to get their name on the scoresheet. For Sao Paolo netminder Rogerio Ceni, popping up with crucial goals has become a matter of course. Yesterday, the 38-year-old dead-ball master scored a decisive free-kick to give Sao Paolo a 2-1 victory over rivals Corinthians. In doing so, the keeper hit a milestone that many strikers would happy to achieve, recording his 100th goal in 21 years as a professional footballer. It was beautiful. As a goalkeeper you don’t enter the match thinking about scoring a goal, but it happened just as I wanted: with a free kick, deciding an important match. For me, it doesn’t matter that it was against Corinthians, but for the fans it must have been important. Although official FIFA records show Ceni to have only hit the net 98 times, the keeper is adamant that two goals which he scored in exhibition games over ten years ago should count towards his tally. 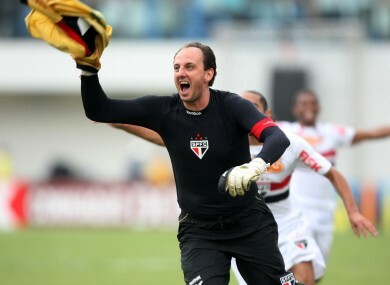 Ceni has 18 caps for the Brazilian national side and was a member of the country’s World Cup squads in 2002 and 2006. Watch his record-breaking goal below. Or, if you fancy some more, check out this compilation of some of his better efforts. Email “WATCH: Brazilian keeper scores ... for the 100th time”. Feedback on “WATCH: Brazilian keeper scores ... for the 100th time”.